Just Married! Congrats to Sydney and Chris!! 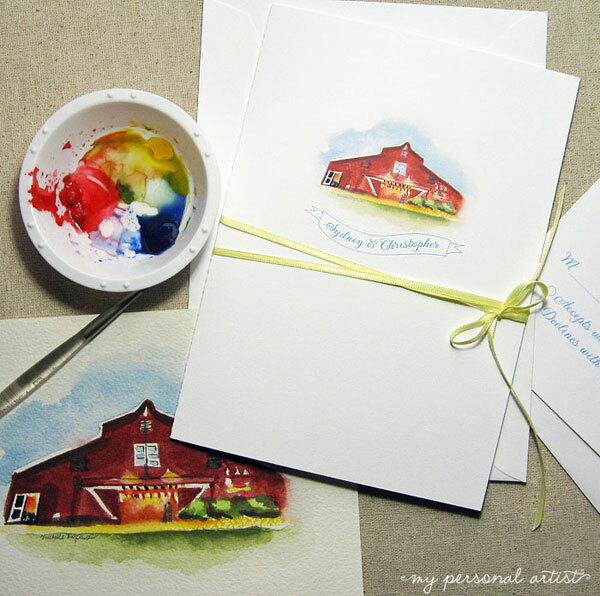 When I was asked to custom design Sydney and Chris’ barn themed wedding invitations, I was thrilled! I had never designed such a theme. After much research, we were ALL very pleased with the results. A white folder invitation in thick white cardstock boasting my hand-painted barn complete with a couple kissing in the door way. Inside a metallic card layer in blue with white invite on top. Hanging outdoor lights streaming on the left side of the card to the right. The invite was scored by hand and hand-folded then wrapped twice with baby yellow satin ribbon and hand-tied into a bow. You can view more details of the invitation on this page. (once like a spark) photography was Sydney and Chris’ photographer. Hop on over to the post “Fun and Spirited So Cal Wedding” over at “A Paper Proposal” to view MORE lovely photos from their wedding including MORE of the stationery I designed for the couple. Another FABULOUSLY FUN couple married!!! 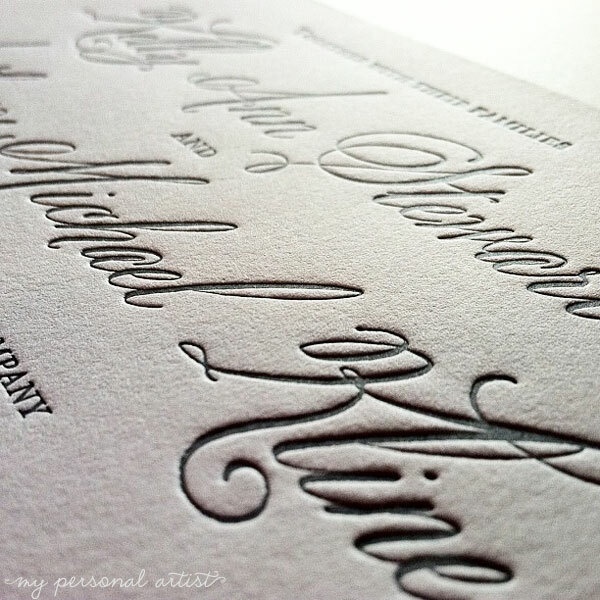 TRENDING today at My Personal Artist are letterpress wedding invitations, MANY shades of pink and gray, and wedding couples’ names boasting LARGE fancy fonts. My favorite font, shown here today is Bellucia Pro. As you can see it letterpresses perfectly into our 100% cotton paper. GorGEousss! Since we do own our VERY own Heidelberg Letterpress Printing Press … our EVERYDAY pricing includes 100 letterpress invitations and reply cards for $477.00. Printed on the finest 300gsm 100% cotton Crane Lettra cards. NOW THAT is affordable!! Questions? Please email our in-house letterpress printer direct james@mypersonalartist.com. This morning I SHED SOME LIGHT on how many watercolor lighthouses I have hand-painted for custom wedding invitations! As I searched for a “lighthouse with a bit of ocean at the base” for Dianna’s place cards, to my surprise I found 7+ lighthouses I had illustrated for invitation designs in the past. I would love to layout samples for you to see the invites for each. But time does not allow that right now. 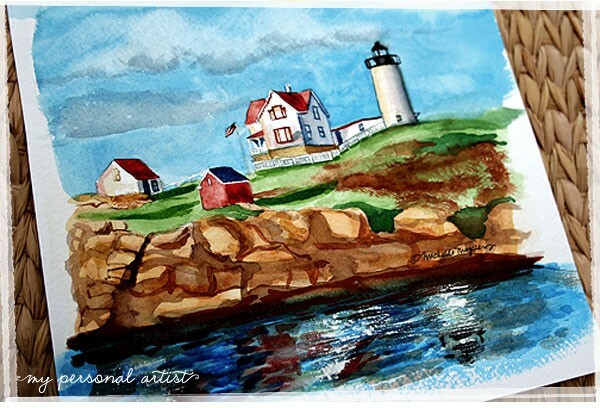 So here you will find the lighthouses in watercolor that are available. 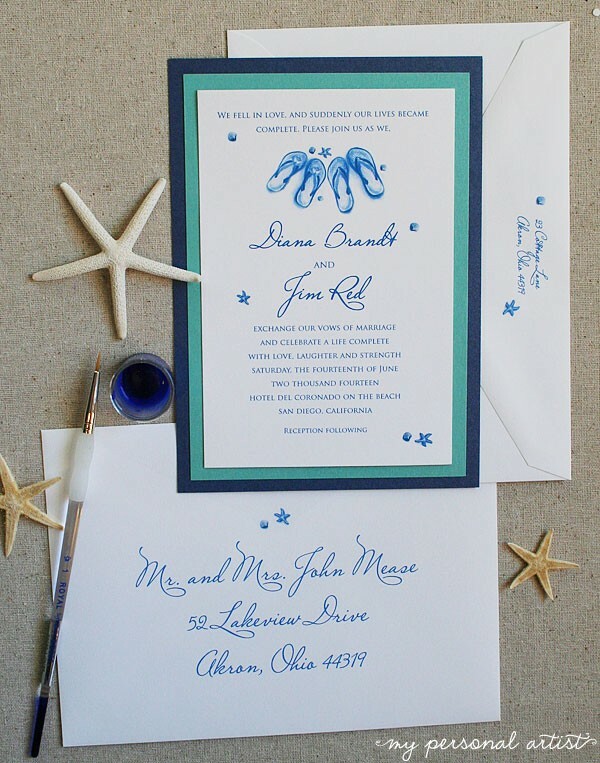 If you want a custom invitation design with a lighthouse that is not shown here, no worries! Just ask me! I personally LOVE to paint them. And they do look so lovely on an invite. 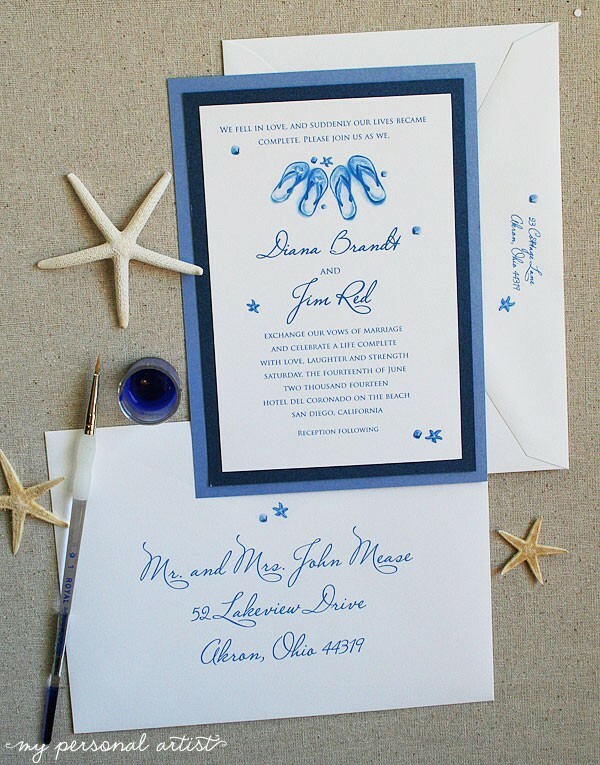 I promise, “in my spare time” I will snap a few photos for nautical invitation ideas! Shown in the upper left corner (not the top photo) and lower right corner the St. Simons Lighthouse in Georgia. Shown in the middle, Marblehead Lighthouse in Ohio. Top right corner is Montauk Point Lighthouse in New York. Bottom left corner, Hope Town Lighthouse in the Bahamas. Middle bottom row, Cape May Lighthouse in New Jersey. And below, York Lighthouse in Maine. Do you have a favorite lighthouse that you have visited in person that you just LOVE? Leave a comment! I would love to hear from you. I am DEEELIGHTED to share my clients, Nancy and Richard’s, custom wedding invitations with you!! (personal wording details were changed for the photo above) Nancy wanted me to design a vintage, bohemian, old Spanish/Mexico wedding invitation for her boasting hand-painted papel picados. Papel Picado means perforated paper and features Mexican folk art. She showed me photos for inspiration which I have now included in the idea board above! I fell in love. So very romantic and the colors… amazing hues of burnt orange, pops of yellow, pink rose, and grass greens as well as bluish greens. I was thrilled to be able to actually hand-paint their names in the custom papel picados for their invitation design! The succulent bouquet, wedding cake, and candles photographs are by the fabulous This Modern Romance Photography. (A HUGE Thank You to them for giving me permission to share the photos!) The color swatches and invitation photos are by My Personal Artist Custom Invitations (that’s me!). The oh-so-romantic hand-embroidered bride-to-be’s wedding dress can be found at BHLDN. The papel picados photo by Mexican Sugar Skull. 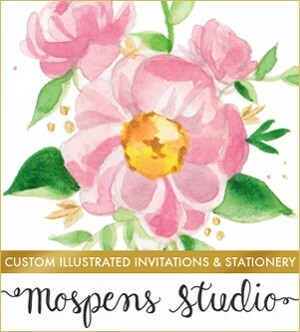 When you are preparing to have me design your custom invitations, send me your personal inspiration photos or create a Pinterest board for me to view!! This way I can match up your personal style for your wedding or event invitations perfectly! 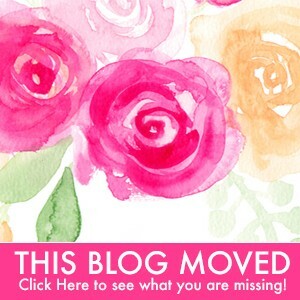 I am always delighted to research color reports and guess what the 2013 wedding and party color trends will be. I’ve been researching wedding colors and trends for over a decade now. What appears to be the TOP trending colors for 2013 are quite a lovely bouquet of hues. I am seeing conflicting reports of neon colors in the UK though. So we shall see! Some may say, well how on EARTH do you know what is TRENDING if 2013 isn’t even here yet. But, oh yes, it is. In the fashion industry they are always a year ahead. ;) And fashion ALWAYS impacts the wedding industry and all color trends. My favorite OF COURSE, it has been for years now … is BEETROOT WATER. What a gorgeous rich hue of fuchsia fandango. I see Coca-Cola red Pantone color 485 is in the mix and a darker hue of Pantone 1805 not quite brick red, I would call it dark red. 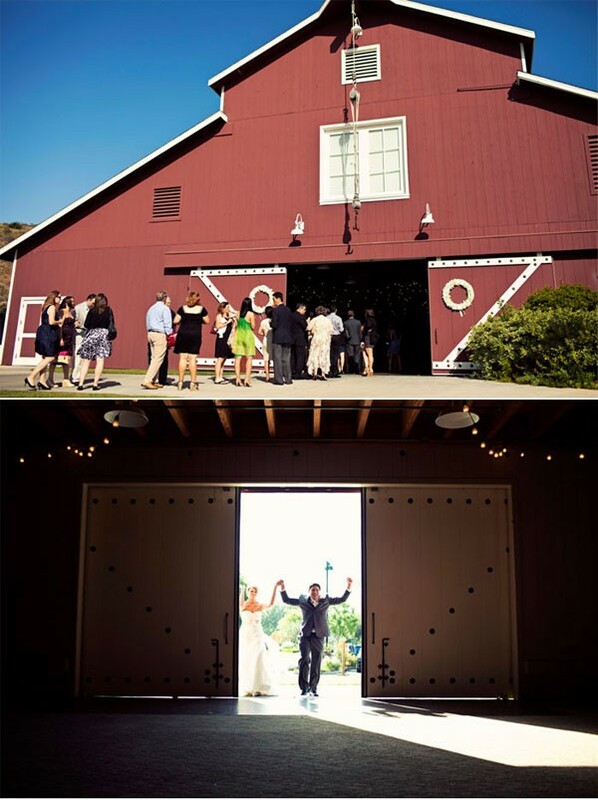 My client Elizabeth recently referred to her wedding colors as black and dark red as well as others. So I actually see this color already trending with my clients at My Personal Artist. One of my favorite combos is Azure Blue with Wisteria Lilac. I married this wedding color combo together for you Sky Blue and Lilac with Green in 2009. Pastels are proving to rule the color charts. As well as rustic hues of burlap brown, rustic cream, and yet another red I’ll call barn red. Good ol’ nautical navy, never disappoints. Although I am seeing a less saturated hue prowling about called BLUE WOLF. Also in the blue family indigo blue is proving its popularity yet another year! Right at their side baby azure blue. I’m guessing blues will RAWK because of the release of The Titanic movie. Plum purple is climbing the color charts at My Personal Artist! It is such a gorgeous color to letterpress! Celadon MINT green and Coral CARROT orange are making a splash in summer colors now. So FRESH like a beachy spring breeze. I have seen LOADS of pins from my fashionista friends on Pinterest with mint and coral. I will continue to research and share my findings with you!!! 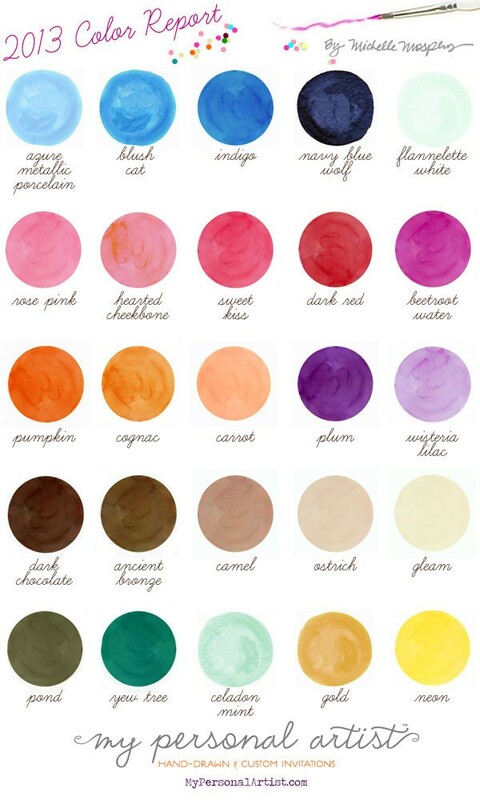 Until then, what are your favorite color combinations of these colors?? Please comment! I would love to hear from you. UPDATE 9/13/12: Today I found the Pantone® Spring 2013 color report!!!! All colors I mentioned are included. Awesome! 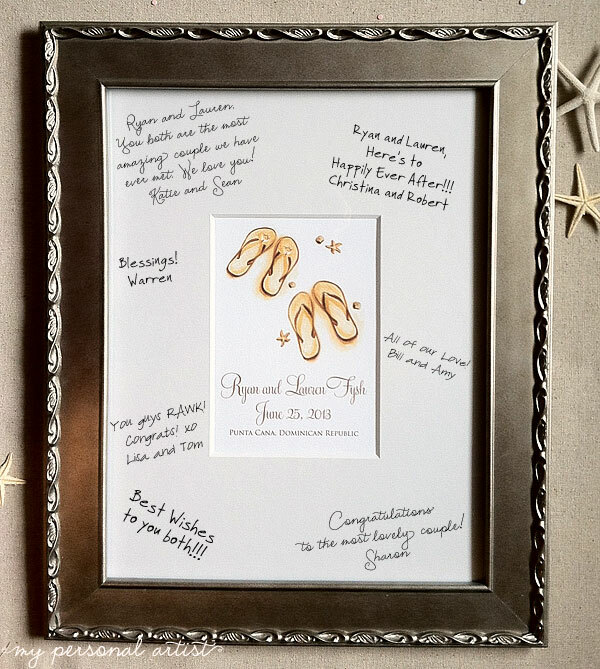 My Personal Artist clients Ryan and Lauren wanted their beach wedding invitation art printed with their names, wedding date, and location for a keepsake. I just LOVED the idea. They wanted their guests to sign and give well wishes! Originally we were going to do a large 11″h x 17″w print, however I thought the smaller print with the matt looked so lovely… they agreed. They bought their own frame and matt, this one is mine (I found while on a RUSH order hunt for parchment paper perfect for a pirate themed announcement yesterday). The print is personalized 7″h x 5″w and fits perfectly in the “photo” spot of the matt. Cost $21.00 for the print. Available to My Personal Artist Clients ONLY (who have bought their invitations with us) at this time. If ever you have questions when ordering from My Personal Artist, always feel free to ask me! 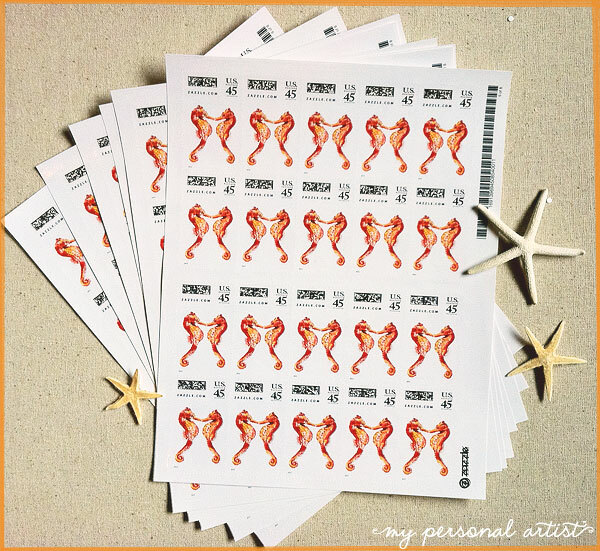 I walked by a table in the studio and found these lovely postage stamps boasting my watercolor seahorses! I just HAD to share! 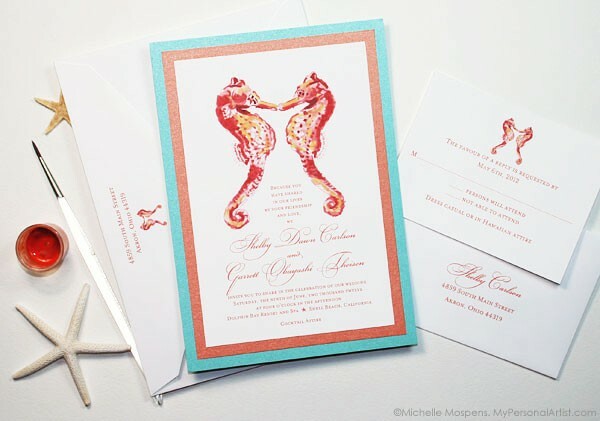 They match our exclusive The Shelby Design Seahorses Wedding Invitations perfectly! You can buy my postage stamps to coordinate with almost all of my artworks in my Zazzle Shop. You must take ONE invitation envelope FULL of every stationery piece you are going to mail and have your local postmaster give you a postage rate quote. Sometimes the cost can also vary depending on WHERE you are mailing your invites to also. Traditional size invitations can also cost more to mail depending on layers and card inserts you add. To be on the safe side always take one filled invite envelope to your local postmaster for current postage rates. After you mail your wedding invites, be prepared to answer MANY phone calls from your friends… did I say PHONE CALLS? Absolutely. They will be so super impressed with how creative YOU and your invitations and stationery are!!! 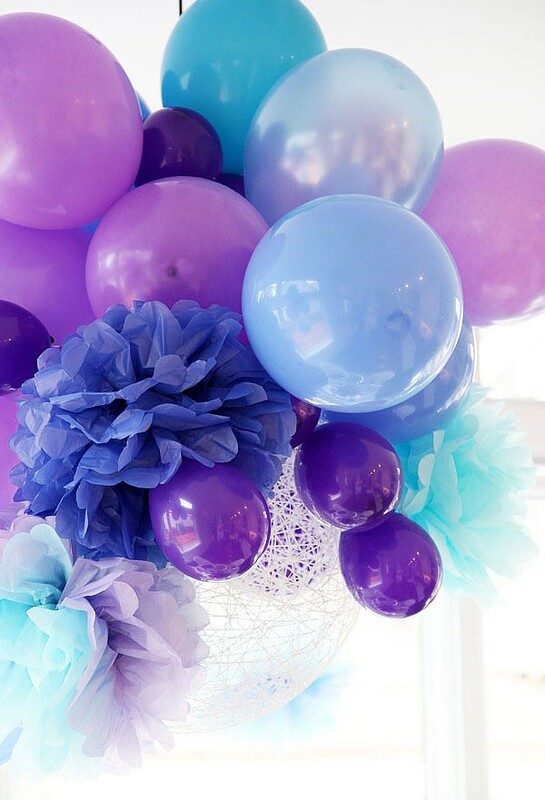 Pretty Purple Party Decorating Ideas! Say THAT 3x. What a FIND! I stumbled upon this fabulous little purple party on Pinterest! The balloons caught my eye immediately. 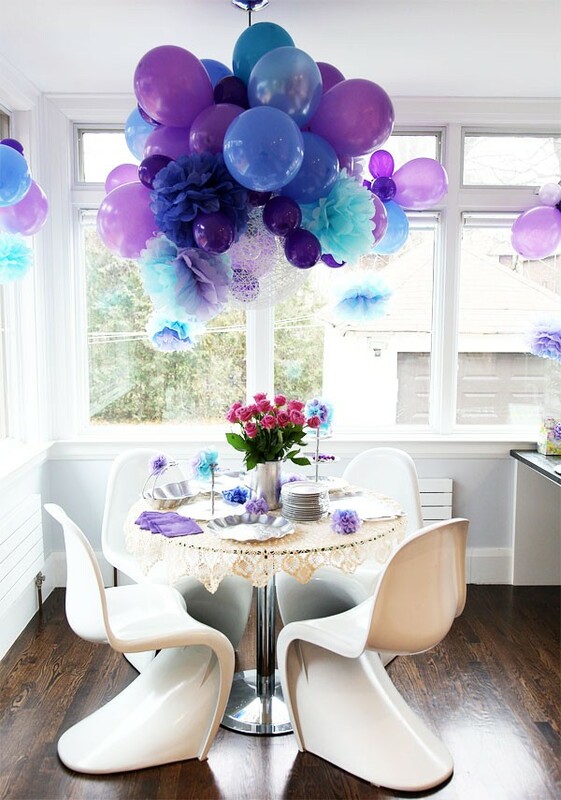 Now if you are going to use balloons to decorate your party, this is the way to do it. Hats off to Shannon over at 8footSIX. I love that this intimate party has limited seating with colorful decorations that POP! (no pun intended) Even though it is a small party, the decorations scream *LET’S CELEBRATE! * Perfect for a bridal shower, birthday party, luncheon, and more. Now go celebrate something!!! AND if you think you threw a fancy party, send your professional (or almost) photos to me to feature on my blog. 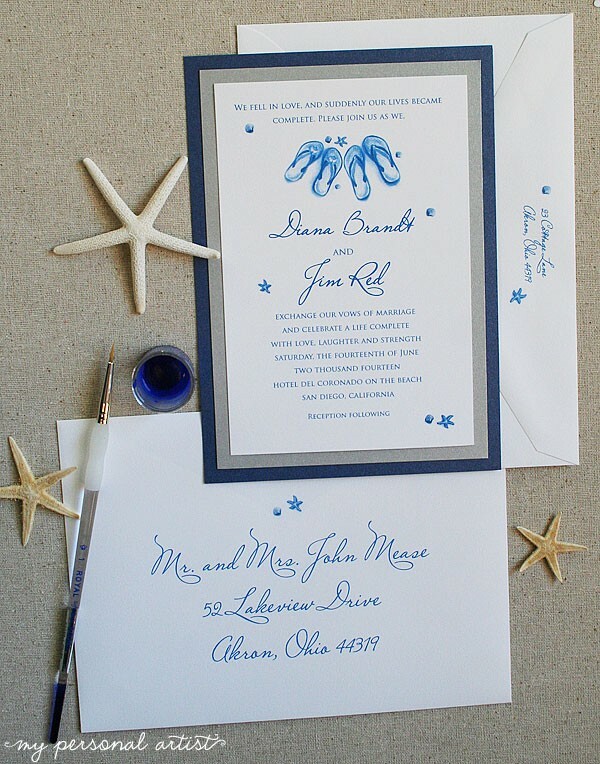 At My Personal Artist customizing our hand-crafted layered invitations to fit your beach wedding color scheme is easy! After you order, tell us the colors you want to see. 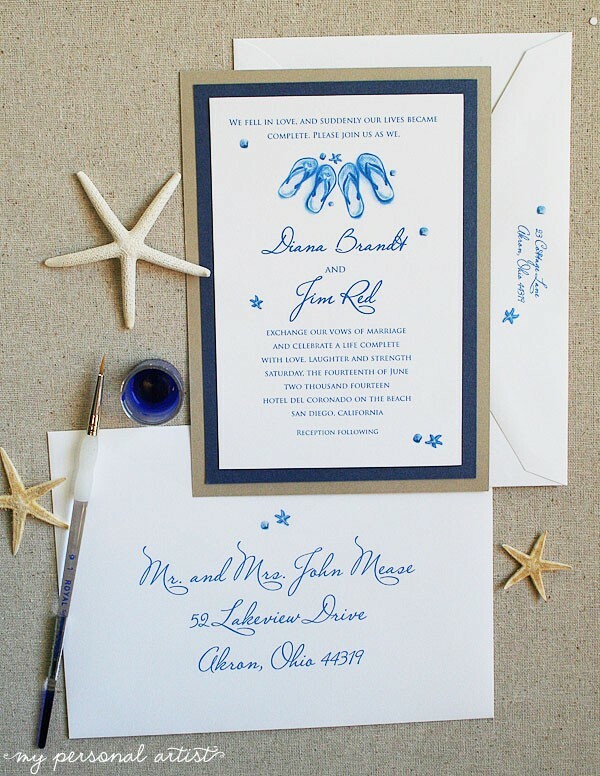 For instance Amy wanted to see all kinds of blues used in comparison with our original brown and sand metallic shimmering cardstock design on our The Lara Ann Design beach wedding invitation. 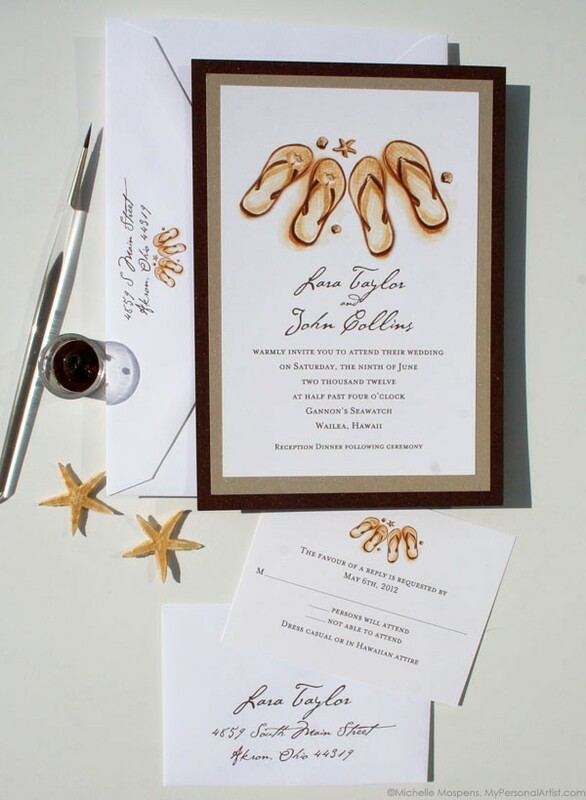 Note how the slight difference in card colors can change the look and feel of our beach theme invitations. As always you can customize your invitation color to match any color scheme. If you are using hot pink, orange, purple, teal, green, or red! No worries, we delight in customizing your invites! 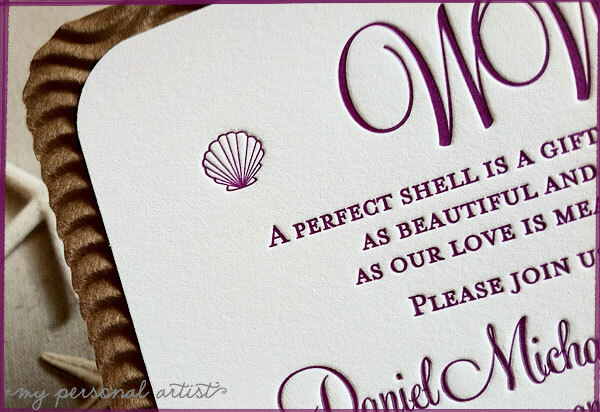 And don’t forget you get to choose your invitation font and font ink colors also! If you want to make one of my artworks larger or smaller, go for it. Just note this in your order. 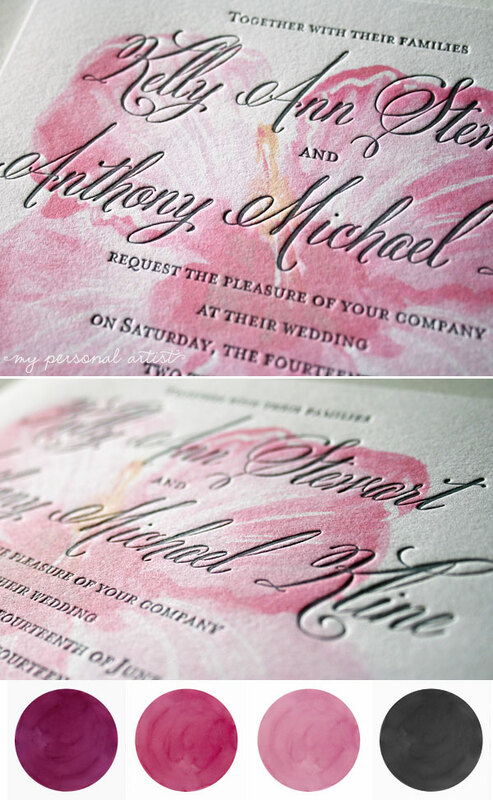 The center invitation card piece, fonts, ink colors, and envelope art has stayed the same throughout all photos. Adding a slightly different hue changes the invite so ever slightly. Which one is your favorite?